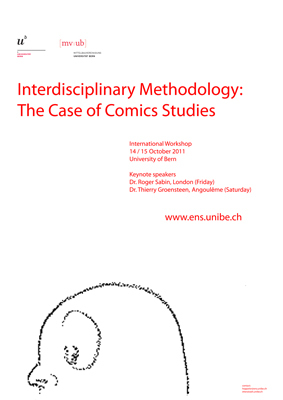 Stephanie Hoppeler, Lukas Etter und Gabriele Rippl weisen auf einen Workshop an der Universität Bern hin, der sich auf die Diskussion von Methoden zur Comicanalyse und ihre Reflektion konzentriert. „Our motivation for this event is to reduce what we see as a stark discrepancy between the popularity of Comics Studies on the one hand and the virtual lack of encompassing methodological reflection on the other. We have planned one keynote speech for each of the two days: Dr. Thierry Groensteeen (freelance lecturer and curator; founder of www.citebd.org) will hold an introductory speech on Friday 14 October, and Dr. Roger Sabin (lecturer at Central St. Martins University of the Arts, London) will give a paper on Saturday 15 October. Each speech shall be followed by several thematic panels, in which researchers will present their papers and thereby introduce a broader discussion. Interessenten wenden sich an die Webseite der Einrichtung oder kontaktieren Stephanie Hoppeler direkt.